The problem with the dredge completed in 2015: timing, said Port Director Juan Kuryla. The $205 million project, which began dredging in 2013, was based on a study completed in 2004 and authorized by Congress in 2007. Since then, cargo ships have outgrown original size projections nearly 50%. To devise a solution, the U.S. Army Corps of Engineers has been allocated $556,250 for a feasibility study regarding port improvements. Susan Jackson, a spokeswoman for the agency, said the study was requested by the port in March because of issues raised by harbor pilots about navigating PortMiami. The study will go before the Miami-Dade County Commission on July 24. When the port’s depth was studied in 2004, the largest ship expected to pass through PortMiami was 6,600 TEUs, said Kuryla. (One TEU is equal to a standard 20-foot-long, 8-foot-tall shipping container.) The 50-foot dredge completed in 2015 was built to accommodate larger, post Panamax ships with drafts up to 50 feet that became more widely used in anticipation of the 2016 Panama Canal expansion. Since mid-2016, South Korea’s Hanjin Shipping Co. collapsed and the cargo industry has consolidated to a half-dozen major players, according to data provider Alphaliner, that now account for nearly 70% of the industry. Larger vessels are more cost effective. That has presented new challenges for PortMiami, which completed the $205 million “Deep Dredge” project that deepened the channel by more than 50 feet in 2015 and allowed the port to accept larger vessels sailing through the expanded Panama Canal. Since the dredge, PortMiami has served nearly 250 post Panamax ships with a deep draft of 39 feet or greater. 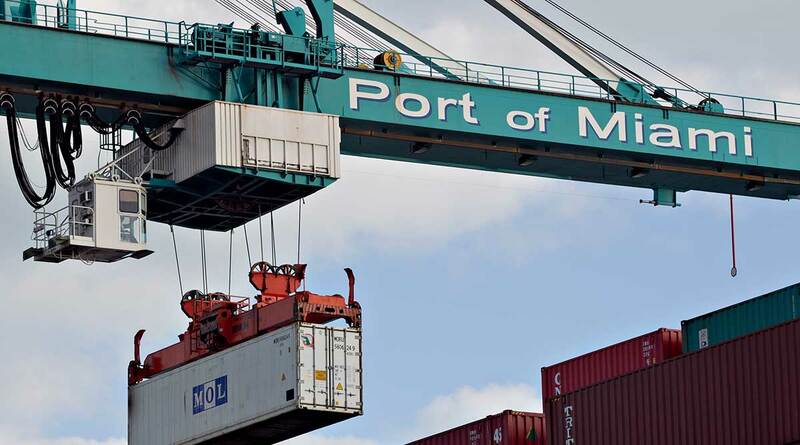 According to the Biscayne Bay Pilots who navigate PortMiami’s channels, huge cargo vessels with capacity for 11,000 TEUs are struggling to maneuver when entering the port from the ocean through the outer entrance channel. The study also will analyze other needs too, Jackson said, including widening the Lummus Turning Basin and Fisherman’s Channel for better maneuvering for Post-Panamax vessels and cruise ships. A deepening of the port also could also help accommodate a new breed of mega containerships — those with capacities of up to 14,000 TEUs — in the future. Cruise ships are also experiencing a tight fit in the Lummus Island Turning Basin and in a bend leading from Fisherman’s Channel to Dodge Island Channel. That means the vessels can’t pass containerships docked at berths when they are being loaded, which creates delays, Jackson said. The Corps also would like to add improvements to the Dodge Island Channel to the federal project, which would allow the port to more efficiently process cruise ships and prepare the port for future cruise industry growth. Two new cruise terminals, one by Royal Caribbean Cruises and another by Norwegian Cruise Line Holdings, are currently being built at PortMiami and are designed so the port can welcome the lines’ largest cruise ships. In Royal Caribbean’s case, that means its behemoth Symphony of the Seas, which will be the largest ship in the world when it arrives at PortMiami in November. The port is in talks to add two more terminals, east of the new Royal and Norwegian terminals, at least one of them for MSC Cruises, Kuryla said. The north channel in that area is deep enough for the largest cruise ships on order, he said, but the port wants to enhance the south channel, where smaller ships traverse, to potentially accommodate midsize ships. “We are looking medium- to long-term,” Kuryla said. According to a study conducted by Martin Associates in 2016 (the most recent), the port contributed to nearly 45,000 direct, induced and indirect jobs and $7.4 billion in economic impact from business service revenue and re-spending and consumption. In 2017, it also broke a world record by welcoming 5.3 million cruise passengers. PortMiami is projected to host 5.4 million visitors in 2018.